BIS Am GCh. Can Ch. Justart Beck and Call a.k.a "Beck"
"Beck" is from the January 24, 2015 "Boo" x "Dawn" litter. Beck is an extremely exciting young dog. His class career was quite short, going WD or better 5 of 6 times shown in the classes, all from the puppy class, even picking up a Group 4 at the huge Rose City classic shows from 9-12. He finished his GCh in short order with another group placement, handled by Jana Brinlee. 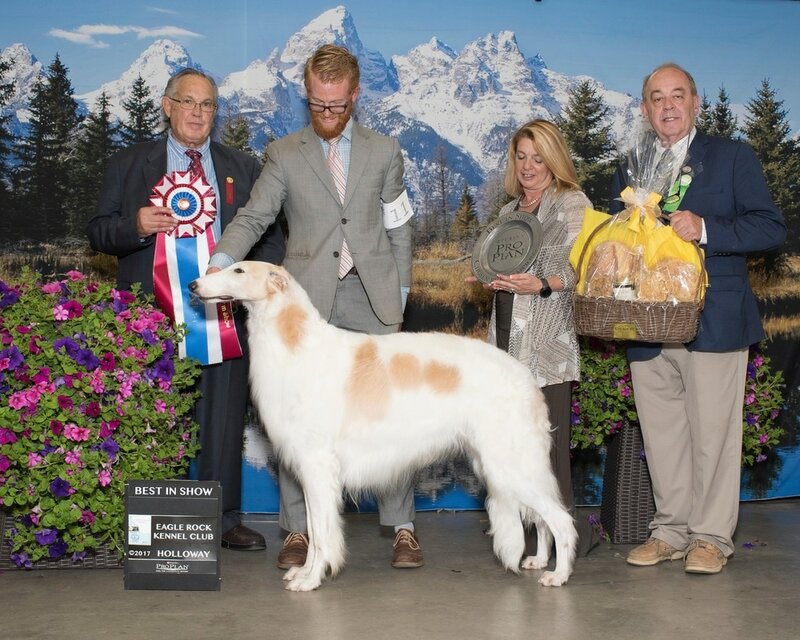 He made our dreams come true by taking an All-Breed Best in Show his third weekend out in 2017 at the Eagle Rock KC, topping an entry of 1100 under John Wade. He is a multiple group winner and placer. He is an exciting combination of his sire and dam and we are absolutely thrilled with how he is maturing. Still only two years of age, he will be shown on a limited basis as he grows. 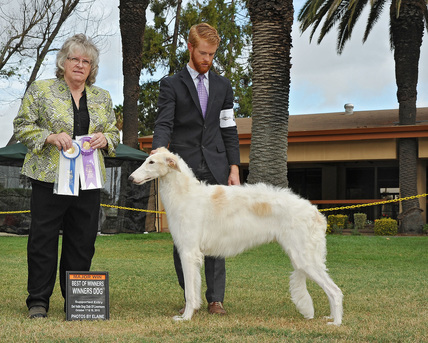 "Beck" is primarily owned by Ray and Jana Brinlee of the famous Jaraluv Scottish Deerhounds (they also bred a few Borzoi litters, and were the 2016 AKC Hound Group Breeders of the Year). Beck is co-owned and bred by Justart and co-bred by Karen Staudt-Cartabona. He is tested OFA DM Normal.